Do you believe that the Kapoor sisters' swag is unparalleled? For Kapoor sisters Kareena and Karisma, "every day is Sibling Day." 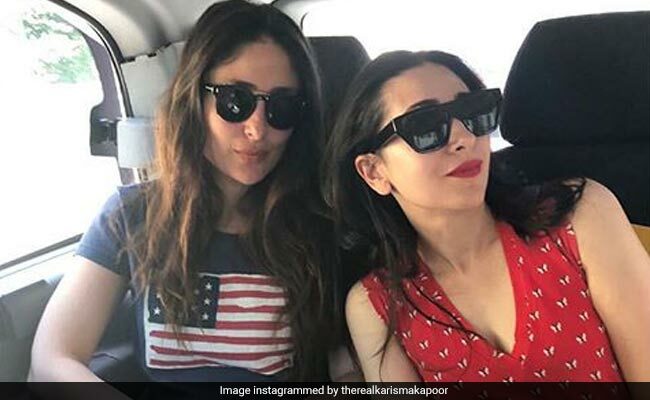 This Monday, Karisma Kapoor found the best way to beat the blues as she shared a photo of hers with Kareena Kapoor on Instagram. "Sibling Day every day," she captioned the post and added: "Monday motivation." In the photo, Kareena and Karisma can be seen seated inside a car as they pose together. We can't tell whether it's a working Monday for the Kapoor sisters but they sure look fab together - Kareena Kapoor sports a casual look in tee and denims while Karisma is pretty as ever in red. Kareena Kapoor hasn't made her official entry on Instagram yet but Karisma makes up for her absence with "sister squad" pictures. Sometime, the Kapoor sisters are "coincidentally twinning." Kareena and Karisma always find time to hang out together amidst their busy scheduled. They are each other's "support system", like Karisma had said in an interview with IANS recently: "Kareena and I are very close and we discuss everything, including our kids. We are both each other's biggest confidante and support system." Karisma also said that she would like to see Kareena playing her role in the remake of 1999 film Biwi No 1. Kareena and Karisma have never co-starred in a movie together but they worked together for an advert for a jewellery brand. On the work front, Kareena Kapoor is filming Good News, co-starring Akshay Kumar, Diljit Dosanjh and Kiara Advani.